PTS Board member the Rev. Dr. Joan Prentice received her master of divinity (M.Div.) from the Seminary in 2005 and her doctor of minsitry (D.Min.) 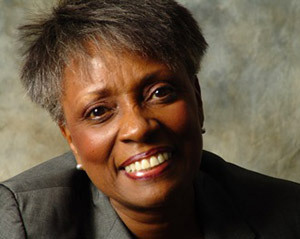 in 2011, but she began serving as staff pastor to new disciples at Pittsburgh’s Mount Ararat Baptist Church in 2000. An ordained American Baptist minister, at Mt. Ararat she spent 15 years focusing on pastoral care and spiritual counseling for new members, as well as curriculum development and volunteer training. But while at Mr. Ararat, Joan also took on another leadership role—as executive director of The Ephesus Project, a Pittsburgh nonprofit to which she now devotes her full-time professional attention. The Ephesus Project is dedicated to providing a distinctively Christian environment of spiritual and educational excellence where clergy, laypersons, community leaders, and seekers can unite in a learning atmosphere to transform lives and communities. Established in 2013, The Ephesus Project—self-described as “Traditional Church in an Untraditional Way”—is a primer for organic and community ministry in a postmodern context. Highly experienced in nonprofit administration, executive and pastoral leadership, and a host of related sub-specialties, Joan says, “The Ephesus Project serves people who are looking to experience relevant and empowering ministry. It builds leaders who can not only sustain but also further the gospel’s transformational work in individuals and their spheres of influence. The Ephesus Project exists in community—among the people, with the people, and through the people.” Joan celebrates that this “Church without Walls” holds true to the tenets of the Christian faith but in unique and creative ways of ministry. “Our vision,” says Joan, “is for a healed community that is aware of its power and that exists in relationship with God and one another for the mission of the gospel of Christ in action.” To make that vision a reality, the Project invites churches, other nonprofits, faith-based organizations, and individuals to participate in and benefit from the various ministries it carries out. Those ministries include New Paradigm Leadership Training, Grace Space Gatherings, Open Word Bible Study and Conversation, pastoral and leadership retreats and focus symposiums, and Mothers United in Christ—a group for women who are called to intercession, family ministry, and outreach. Through Joan’s leadership and the participation of people from all walks of life, The Ephesus Project is helping to meet the challenges of the church, community, and leaders of Pittsburgh in our dynamic, 21st-century cultural context.